Stop preventable vehicle accidents in their tracks. 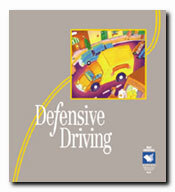 Teach employees safe driving skills with these recently updated copy-ready pages on defensive driving basics, covering such topics as scanning ahead, driving on bad roads, passing, proper following distances and auto emergencies. Encourage greater employee participation with case study worksheets. Run a responsible fleet with fleet management materials that give you driver applications, interview checklists, daily reports, tests and more. Are You a "Type A" Driver? Can You Sober Up Someone Who Has Been Drinking? How Much Alcohol in These Drinks?